Cosmic Spins Casino Bonus: £5 Welcome Bonus No Deposit Required! Claim Your Free £5 No Deposit Bonus When You Join New Casino Cosmic Spins! The brand new Cosmic Spins Casino Bonus rewards all new players with a very generous free £5 No Deposit Bonus. Plus there’s a full welcome package of £150 and 150 Starburst Bonus Spins waiting for you. 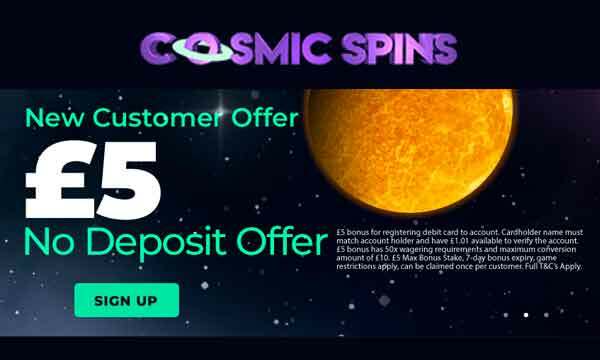 When you first join Cosmic Spin Casino you can get a £5 no deposit bonus. 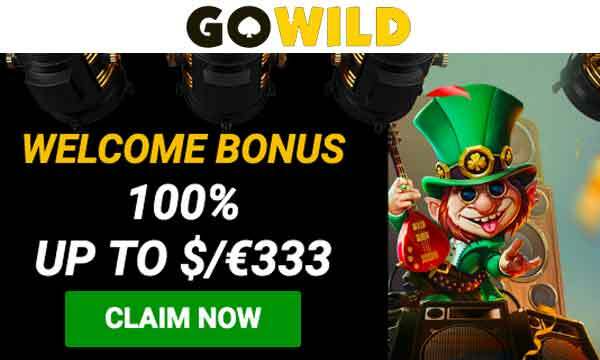 This bonus can be played on a number of different games and is a great way of getting your new casino experience started. If you like what you see when you have played your no deposit bonus, you can carry on and get even bigger rewards with the full Cosmic Spins Casino Bonus. That’s 50 Bonus spins on all 3 deposits! These spins can be played on the following games: Starburst, Aloha! Cluster Pays, The Legend of Shangri-La and Berryburst. All spins are at a value of £0.1. 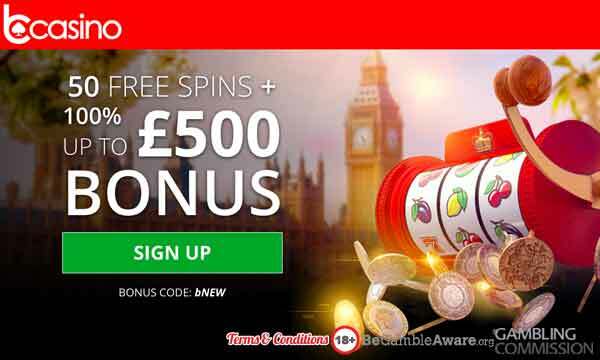 There is no deposit required to claim the free £5 registration bonus. Minimum deposit for the match bonus and bonus spins on your first 2 deposits are set at £10. Minimum deposit on the third deposit bonus is £20. The no deposit bonus funds are subject to a 50x wagering requirement. So, as you get £5 free the wagering requirement is £250. Deposit bonus funds including free spins winnings require 50x wagering before they can be turned into real cash funds and withdrawn. Cosmic Spins also run a VIP Casino Scheme for their most loyal and biggest players. It is an invite only club but once you are in you’ll be able to get you hands on some great bonuses and receive invites to the most amazing events. The main games category at Cosmic Spins is slots. They have an impressive range of titles from an impressive range of slots providers. If you’re into slots then it’s a great place to try out. There are also other categories such as live table games, classic roulette and classic blackjack. Cosmic Spins is a brand new casino that launched early 2019. They have made a few waves in the industry and have attracted many players as a result of their free £5 no deposit bonus. The full Cosmic Spins Casino Bonus is also very rewarding when you make your first 3 deposits. 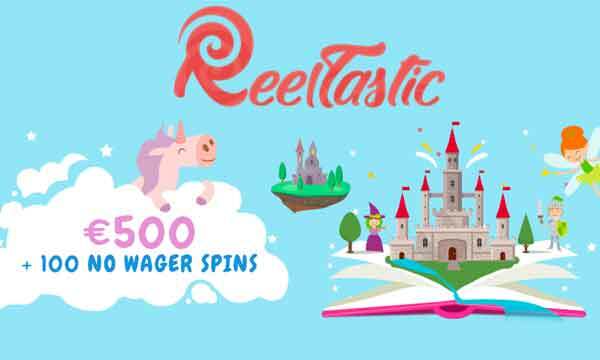 In total you can claim £150 in bonus cash and 150 bonus spins on 4 top slots games. You could say that their welcome bonus is out of this world! As you might have guessed, the theme for Cosmic Spins is Space. The background and general design all have an astro feel. It’s sort of ok, but we think they could have done a little more in improving some of the graphics. Cosmic Spins is regulated by the UKGC and has a number of secure payment options including PayPal, Skrill, Neteller, Visa and Maestro. Customer support is available via live chat and email. Plus there is a hand FAQ section to refer to if you get stuck. Why not try out Cosmic Spins today with a free £5 No Deposit Bonus? !